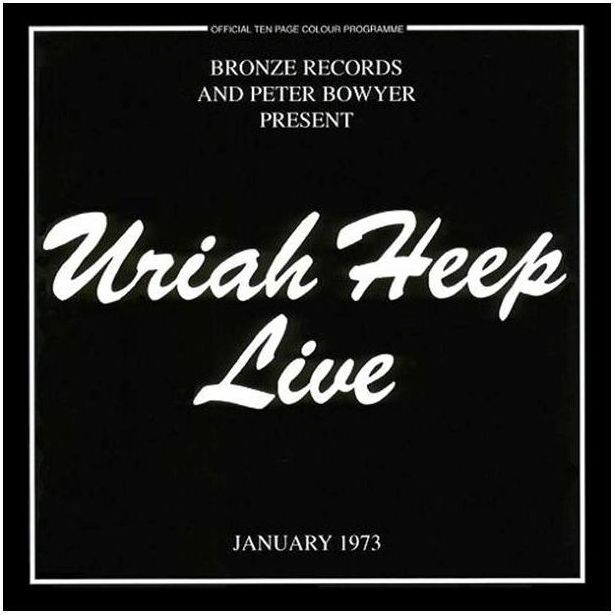 Way back in 1973 Uriah Heep fronted by David Byron released arguably one of the all-time great live albums. Simply entitled Live 1973 it had been recorded during a cold English January at the historic Birmingham Town Hall in the industrial heartland of the midlands and dramatically captures a band at the very peak of their vibrant power. The glossy black exterior of the double vinyl album contained a ten-page program on the front of which was legendary rock photographer Fin Costello’s dramatic photograph of David Byron. Somehow in a fraction of a second, or a click of the camera’s shutter he managed to preserve a moment that conveys everything that Uriah Heep was about. This one shot shows why a few photographers are out there at the very top of their field and why the rest of us just take snaps. This is the type of image that separates the great from the good and this great photograph portraying a great performer achieves exactly that. It captures the drama, the excitement, the undeniable showmanship and timeless wonder of the man and the band in one magical frame. Of course these are mere words or even, perhaps, overused and somewhat tired superlatives, plucked from the air in an attempt to try and describe the experience of actually being there. On the one hand he is frozen in time, on the other he is seemingly ready to leap from the page dramatically reigniting long planted memories of an exceptional era as if it were taking place right here and right now. Place the needle on the record and it magically comes back to life in all its potent glory. The sound, the smell, the electric excitement, the melodic bass pounding against chest – all of it - everything – brought back to life as if all that subsequent time had somehow never happened. I am not sure what brought you to this page. Maybe some of you are tired of us, by that I mean rock fans of a certain vintage, going on about these distant times and wish to see for yourself what all the glassy eyed recollections are all about. Or maybe you were there as well. Believe me when I say that any of us lucky enough to be in the second category and witnessed it first hand will confirm that seeing this band at this particular time often proved to be an unforgettable experience. Maybe you were there or maybe wished you had been but whatever group you are from, you are here on David’s website and now that you are I strongly suggest you stay awhile and enjoy the trip as you delve deeper into the reasons for the rabid enthusiasm that such an experience generated. So why does it remain a memory that remains indelibly printed upon many people’s musical DNA. Despite the passage of more time than we care to acknowledge I can still taste the anticipation, can still feel the excitement and remember in minute detail the entire evening as if it were last week. In my case the evening in question was in fact over 35 years ago and the place was the Hammersmith Odeon in West London . I was in my late teens and I had been to the huge old cinema many times already to see some of the biggest and greatest bands of the era but for this particular evening I had gone there to see Uriah Heep. It is strange how certain apparently small details remain ingrained for years and become essential elements of who we became and how and why we arrived at the person that now stares back from the mirror. For me, one of those moments came a while before I set off for my own personal audience with Heep at Hammersmith. It was the day Sweet Freedom was released and I waited outside my local record store watching as they set up a cardboard stand display of the vivid orange/red of the new album contrasting dramatically with the glossy black cover of Live ‘73. Having played those albums countless times I worked my way backwards through Demons & Wizards, Magicians Birthday, Look At Yourself, Very ‘Eavy and Salisbury. There was something magical about the whole experience that hasn’t been dimmed by years or the passing of youthful enthusiasm. I remember staring at the aforementioned photograph on the Live ‘73 album of their silver-suited lead-singer David Byron, arms outstretched, mane of hair on tilted back head and those wild staring eyes. Combine that with hearing ‘that’ voice and I was immediately captivated, totally under a spell befitting something from a genuine Magicians Birthday. The voice (a name he later used for his rock star house), the photograph and the opening lines of the album made seeing the band something that I simply had to do. Remember this was a time when we were blessed with some truly legendary bands. Barely a month passed when we didn’t have the chance to see one of them. It had us queuing down the street for tickets and waiting with rabid anticipation for the new album or the concert date to arrive. So there I was (not sure if it was a July Morning) at last, with a ticket in my pocket to see Uriah Heep – a band literally crammed with talent – and I couldn’t wait. As we’ve seen, that line-up included the mercurial Mick Box diminutive guitar god at stage left. The bands’ chief songwriter Ken Hensley to the right rhythmically rocking his seat so violently behind the keyboards that it is a wonder it remained intact. Then there was arguably one of the all time great rock bass players the impossibly thin Gary Thain striding on impossibly heeled boots amid a permanent cigarette haze and a mass of hair covering most of his face whilst delivering a mesmerizing blend of melodic power through a bass that hit you in the chest like a hammer. Behind all of this was bands engine room the jovial powerhouse that was drummer Lee Kerslake. However, when David Byron sprung onto that stage in a whirlwind of lights something even more magical occurred that made it impossible to take your eyes off him. He had a near indescribably powerful and compulsive stage presence combining to provide an instantaneous impact. He oozed that indefinable quality that only the real ‘stars’ have - charisma - and the result was a truly unforgettable experience for everyone lucky enough to be in that huge audience. He worked each and every one of us like an old time circus ring master whilst delivering vocals that somehow rose above the sheer power of the band he fronted. As we all left, drained and charged in equal measure, we were convinced that he had made direct eye contact with us. We may have been just one face amid a huge crowd but irrespective of how far back, or how far left or right from the centre of the stage you may have been he seemed to pick you out individually with a look, a wave, a smile or anything from a glance to a stare with those laser eyes that burned into you in such a personal way that you felt a strong and instant connection. I was lucky enough to see many of the legends of the era and they all impressed me in their own individual way but here was, and I don’t necessarily like the overused modern throwaway meaning of the word, a ‘star’ in the old fashioned and real sense. Lasting and unforgettable it was an experience powerful enough to instantly transport you back across the decades to a time when you were young and had so much to look forward to. Ask any of the vast majority of Heep fans who experienced David Byron in his prime and in full flow what their memories are and then sit back and watch grown men’s eyes moisten as they recall similar emotions. Be warned though as this will result in them talking for hours about the aura and presence, the charisma, charm, showmanship and yes his greatness. It isn’t too grand a claim to say that it actually changed a part of my life. Let me explain. Many, many years later and long after David’s life had ended, I was ‘busy’ working my way through my old vinyl collection when I came across Uriah Heep. The track was ‘Rain’ and the voice was David’s. I felt a tangible shiver of presence and experienced that rush all over again with the images and emotions from my evening spent in the presence of greatness flooding back into my mind. So much so, that I crazily announced that I would try to write a book in the hope of conveying just how strongly those feeling were. 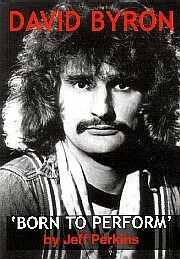 The next day I searched the internet and to my amazement found very little on the life of David Byron. What I did find set me out on a journey through his life from beginning to end whilst attempting to fill in some of the gaps in between. This path took me to his birthplace, his childhood home, his school, the places where Spice (later Uriah Heep) first played and practiced, his beautiful rock star house, and the place where he spent the last frustrating and tragic weeks of his life in a losing battle with his own personal demons. I saw letters from fans and the replies he sent back. I saw his school reports and the documents of a life through birth, marriage and death and much, much more. Along the way I met his band mates, roadies, fans and friends from his Heep days and beyond. These included colleagues from his later career with Rough Diamond and the Byron Band as well as his various solo projects. It was like a journey of detective work that included many false leads, myths and misinformation to trip over. In the end the book came out carrying a title given to me by none other than Ken Hensley who had used the expression ‘born to perform’ several times during our interview. It provided the perfect title especially as it came from someone who knew him, worked with him and experienced first hand all the ups and downs, tears, tantrums and triumphs and the pleasure and pressure that came from being in the phenomenon that was Uriah Heep. In just a few weeks and with no advertising at all my genuine attempt of a book had sold out confirming to me that I was anything but alone in my undying admiration, respect and affection for his memory. As a footnote I recently went to a conference in Birmingham and was delighted to find that it was being held at the very same Town Hall where ‘Live ’73’ had been recorded. It proved to be a warming experience. The grand old building has doubtless witnessed many events of varying importance throughout its history but believe me that ‘Friday Night in Birmingham ’ is firmly implanted within its very fabric. I found the whole experience strangely uplifting as I realized that life and lives remain all around us if only we look deeply enough. The work that this website has done to unearth and make available some of the ‘lost’ David Byron recordings is truly remarkable. Through my attempts to write my book I can confirm just how deeply some of this material has been buried beneath the sands of time. I also know just how emotional an experience it can be delving into the life, times and work of such a powerful personality. For years after I finished my own project I couldn’t listen to any of David’s music I had simply got too close to him to be able to play them in the same way. Through this websites experience I am now ready to start enjoying it all over again and believe me the effect is as strong as ever. I can’t thank them enough. I am sure that as you delve into this website dedicated to the memory of David Byron you will find that his presence remains and the light that radiated from that stage all those years ago shines as brightly as ever. Such is the ever lasting legacy of David Byron. Enjoy.